For the last few months, the royal wedding has been the talk of the town. You see, Harry and Meghan are very special people and are therefore given royal treatment wherever they go. Similarly, it is advisable to give royal treatment to people and things that are important to you. For instance, your car is a great investment as it helps you to manage your professional and personal life. In a nutshell, it gives you convenience, independence, and liberty. For the car to perform optimally, it deserves royal treatment. This simply means giving it elaborate attention and treating it with a lot of care. There are several things you can do to treat your car like royalty. Tyres are important as they bring the car in contact with the road. For tyres to perform optimally, they should have the right pressure and the correct tread depth. They should also be properly aligned and balanced. Tyres should ideally be inspected every month but you can have them checked more often depending on the conditions of the roads on which you drive. When they are checked regularly, small problems are identified and fixed before they deteriorate. Car service is a procedure performed on a car using a designated schedule, time interval, or after covering a certain distance. Car manufacturers know the capability of a car and therefore recommend a regular service so that it can run reliably at all times. Regular car service takes a few hours and it may include a checkup, tune-up, replacement, repairs, and top up of fluids among other things. Full car maintenance takes longer than regular service as it involves thorough checking of the functioning of the entire car. It should be carried out annually but more often for older cars. It should be done by a professional and includes checking the engine, battery system, hose pipes, fuel injectors, clutch release, and timing belt among other things. If your follow recommended service schedules, you will spend less on maintenance. This is a compulsory test that is carried out on vehicles whose age exceeds three years. The purpose of the test is to find out the road-worthiness of the car. A car that does not pass the test must go through a re-test, which forces you to incur extra costs. If your car has been going for regular service and maintenance, it might only require a few fixes here and there to pass the MOT tests. It is clear that if you don’t service and maintain your car regularly, it may develop problems that may go unnoticed. The car deteriorates with every scheduled service or maintenance that you skip. This could eventually lead to total breakdown of the car leading to huge costs of repair. A neglected car is unlikely to pass the MOT tests which are required by law. Neglect also makes the car to lose value and compromises your safety. Your car is a worthwhile investment and you should therefore give it all the attention it requires. In fact, it deserves royal treatment. 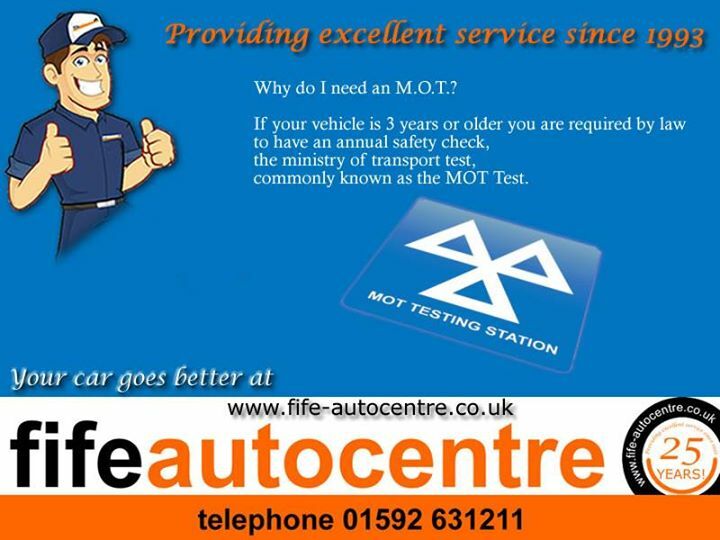 You could visit Fife Autocentre in Dundee for high quality tyres and professional car maintenance services.